Progress of the Seasons Journal: 24 April, 1832-1862. Another illustration from Emmons’ book, an apple a day…. Here is the historical phenology report from the ‘Progress of the Seasons Project’ (hvfarmscape.org/seasons) for 24 April. Current Events: It’s been cold and damp – Spring is hunkered down. There are few new events in the historical data for today, so it’s worthwhile reflecting on some of the on-going features. A quick perusal of the below geographical summaries shows that many fruit trees are in bloom – Cherries, Peaches, Plums, Apples… That led me to wonder about the land these historical observers were walking through and how that compares to today. Unfortunately (for the fruit historian), it seems that detailed fruit data were not collected by the census until 1890 (see graph), although information on livestock, grains and vegetables began to be reported at least as early as 1845. This was probably not an oversight – fruit was simply not considered much of a commercial crop. It was not unimportant to the family but, apparently, it was not seen as a frontier of agro-economic development. He goes on to report that things are changing, and farmers are growing more interested in the topic. 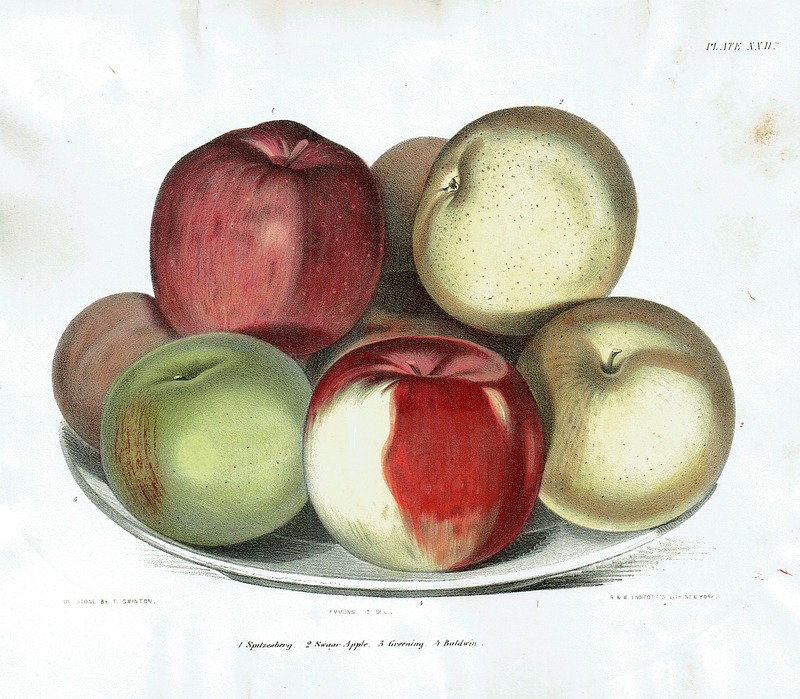 His illustrated 1851 volumes on NY fruits (from which these images come) could be seen as fruit boosterism seeking to convince people these were crops worth focusing effort on. So, as you read these reports of the flowering of different fruits, consider that they were gathered over a period of years that probably say such plants go from welcome accessories of the home garden to commercial ventures in and of themselves. In fact, in the absence of any other statistical data, the flowering occurrence information may give us a geographical glimpse into early agricultural details that might not otherwise be available. For example, our maps of fruit flowering occurrences in the 1830s -1850s might be some of the few maps depicting NYS fruit growing during this era. 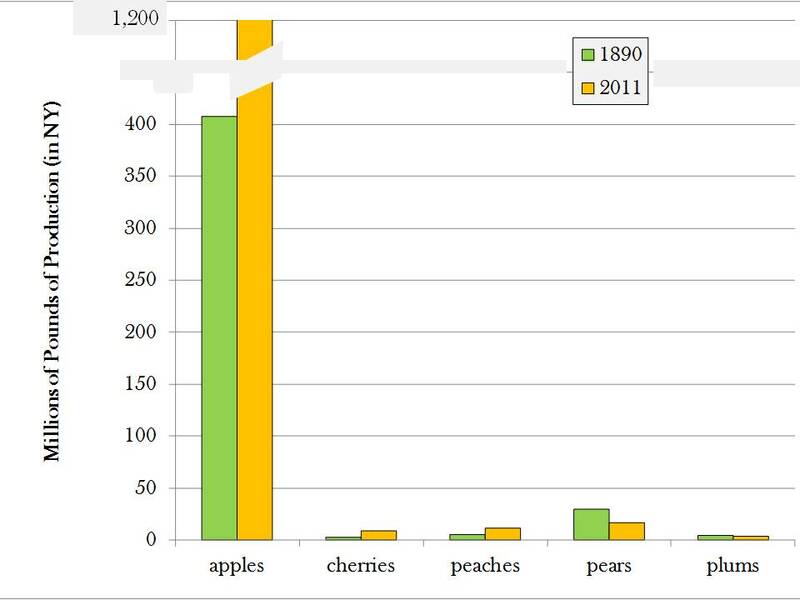 A comparison of modern (2011) and historical (1890) tree fruit production stats for NYS. Pears and Plums have both declined in absolute terms although, apparently, none ever aspired to apple’s lofty levels of production. Unfortunately, I know of no earlier production stats; if you do, please let me know. Herbs: Trout Lily flowering around Chatham on this day in 1852. Woodies: In the woods, Black Cherry, Tulip Tree, and White Oak in leaf with Shadbush in flower. Lilac is leafing out in the garden. Birds: Barn Swallows arrive to Kinderhook on 24 April 1842. Other Critters: Frogs first heard at Kinderhook on this day in 1847. Agriculture: Cherry blooming on this date in Kinderhook in 1840 & 1842.Peaches bloom near Fishkill Landing in 1858 and 1859. Plum also flowering. Herbs: Gardens and lots see Daffodil and Dandelion (three records) in flower on this date. In the more forested reaches, Wood Anemone begins to flower on two occasions, Bluebells (in wood or garden?) was noted as were Spring Beauty and Trillium. A beautiful, probably purple rash of violets spread across the region with four first flowerings reported for 24 April. Woodies: Red Maple blooms in Westchester while, in the same year (1855), it leafs out at Erasmus Hall. Locust trees bloom while Horse Chestnut begins to leaf out. Birds: Three Swallow arrivals and a Martin first sighting. Other Critters: Butterflies first noted in Westchester County in 1855. 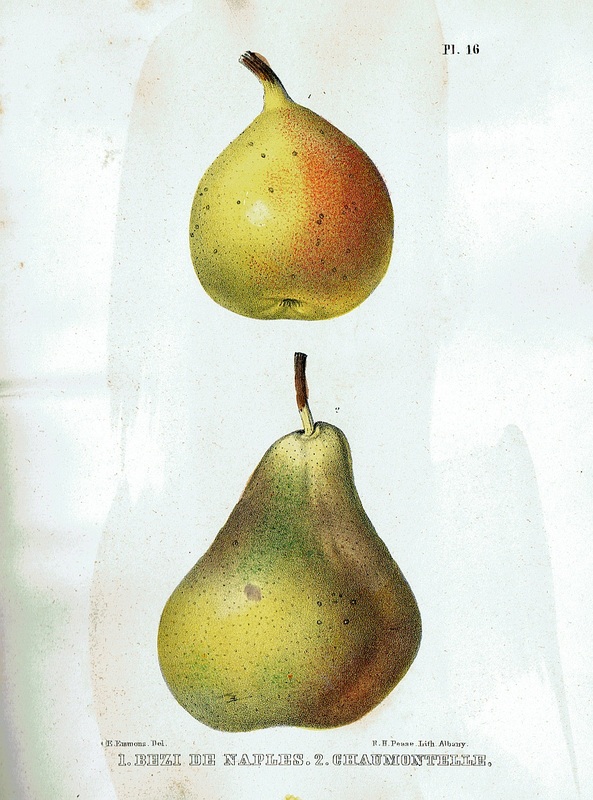 A pair o’ Pears from Emmons. Agriculture: Currant flowering seems to be happening in earnest with four flowering records from this date and one more for closely related Gooseberries. There is also one Currant leaf out record. Peaches aren’t laggards either with four recorded Peach blooms. Apple blooming begins on this day in 1845 in Westchester County, nine years later and a bit farther south, apple leaf out begins. One Apricot flowering record, and two each of blooming Cherries, Pears, Plums and Strawberries. Herbs: Hepatica blooming the woods. Birds: Geese seen flying north. Agriculture: On Saturday, April 24 1841, Washington County farms began ploughing. Herbs: Myrtle blooming around the house and Bloodroot in the woods. Birds: A trio of Swallow arrivals recorded and one first sighting of Martins. Herbs: Daffodils and Dandelions shine yellow around home and yard. Birds: Swallows first seen swooping and diving. Agriculture: Pear and Plum starting to flower. 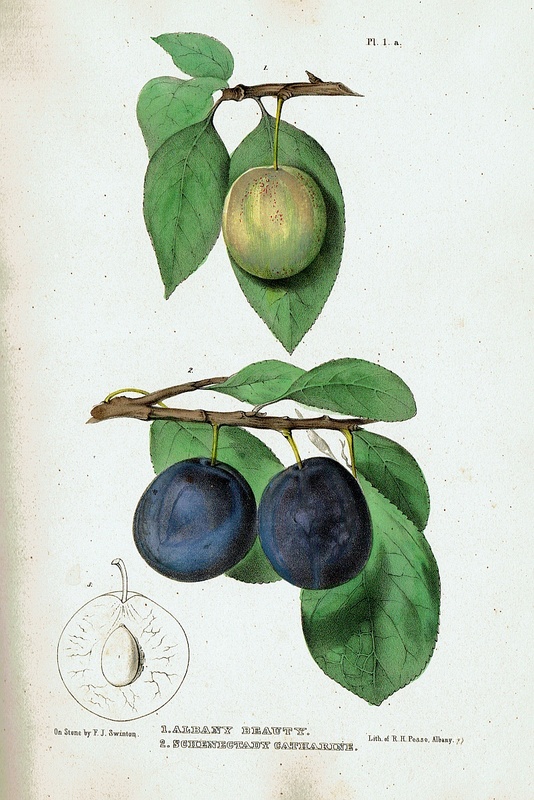 Plums as illustrated in Ebenezer Emmons’ 1851 work on NYS fruits. Note the regional names “Albany Beauty” and “Schenectady Catherine”. Herbs: Spring Beauty gracing the woods at two sites in 1841. Hepatica and Sweet White Violet also adding life. Woodies: Red Maple seems to be flowering at a pair of sites., and Lilac blooms in the garden. Birds: As the American Civil War was just starting to become a reality, swallows arrived on this day in 1861. A pair of Martin arrivals were noted in earlier years, and, in one year, Pheobes a-lit. Herbs: Trout Lilly a-bloom in the woods. Woodies: Shadbush flowers during a couple of years. Elm also reported in bloom. Agriculture: Peaches and Cherries lead the fruit tree pack, each having three reported flowerings on this date. Apple trees follow with a pair of blooming years. Currants in flower on this date in 1840. 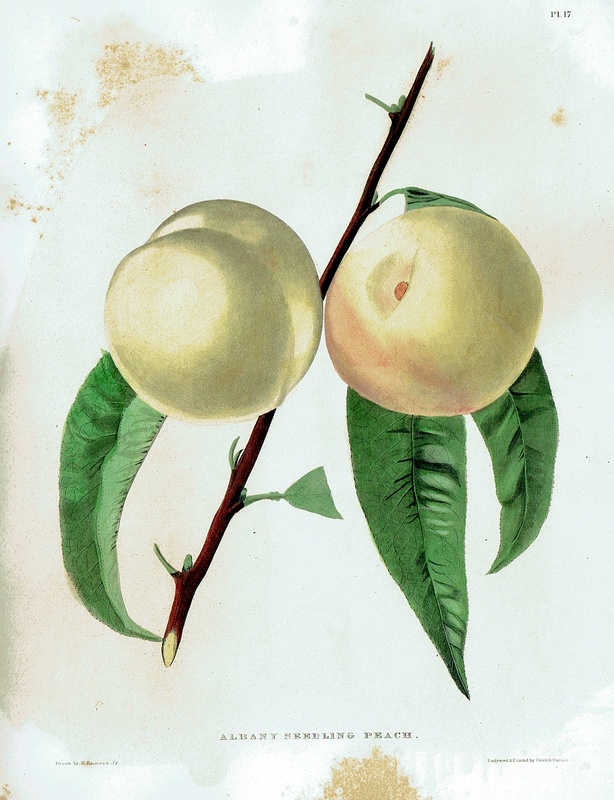 The “Albany Seedling Peach” as depicted in Emmons’ book. Herbs: Trailing Arbutus getting up steam with four reports of flowering from this date. Trout Lily noted on a couple of occasions. Violets and Hepatica make solo appearances, as does the woodland sedge, Carex pedunculata. Woodies: Red maple flowers, Lilac leafs out. Birds: One Swallow arrival on this date in 1841. Agriculture: A pair of Peach, a pair of Currant, and a pair of Plum blooms noted, together with single showings for Apple and Cherry. 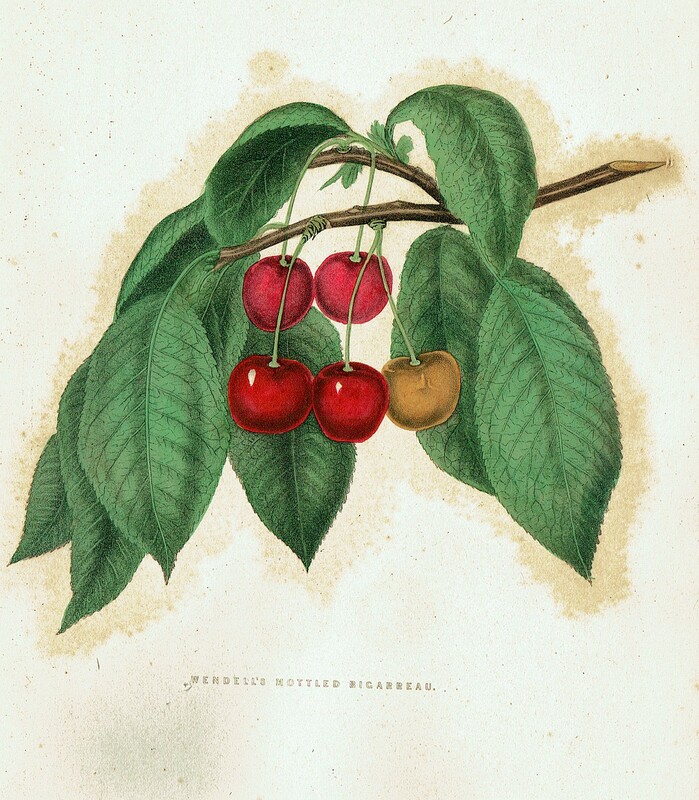 Cherries as shown in Emmons’ work. Woodies: Shadbush blooming here too. Herbs: Spring Beauty in the woods. Woodies: Shadbush’s white against winter grey beginning to show itself. Agriculture: Cherry blooming on the Western Frontier.